In August last year, Fender unveiled its very first app, Tune, which, as you'd expect, is a guitar tuner. We lamented the fact it was only on iOS, so we're thanking our lucky stars that it's now available for Android. 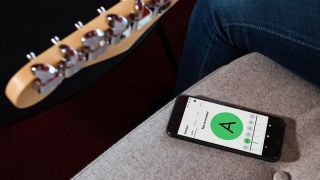 As per the iOS version, Fender Tune promises an intuitive, easy-to-use interface that makes it easy for newcomers to get their instrument in tune, while also covering basic tone tips, including strumming and setting up amps. Fender reckons its DSP technology delivers spot-on accuracy, as well as offering nifty adaptive feedback bubbles. You can download Fender Tune now absolutely free from Google Play.